How to Make NoteBurner Spotify Music Converter Work at 5X Speed? Currently, NoteBurner Spotify Music Converter only supports converting music from Spotify V1.0.87.491 or above at 1X speed with SIP enabled. So in order to convert music files at up to 5X speed, you’ll need to turn SIP off. Here we will show you the concrete steps to turn SIP off for getting higher speed. Before you do this, it is important to get informed about what System Integrity Protection is, and what it means to turn it off. If you decide to partially disable SIP, you will be able to convert Spotify music at up to 5X speed with the help of NoteBurner as before. Note: Your machine may be less secure if you do. We strongly suggest you enable SIP again after finish the converting with NoteBurner Spotify Music Converter for Mac program. Step 1. You must boot into the Recovery OS. You do this by restarting your machine, and holding COMMAND + R until the Apple logo appears. 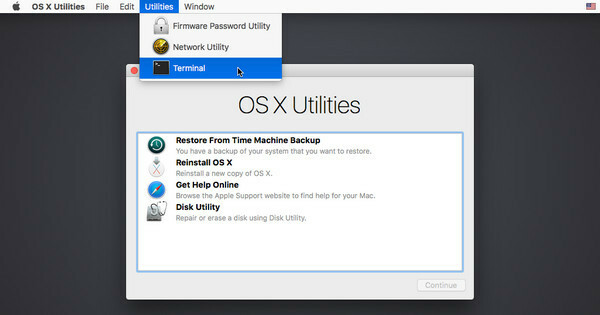 Then select Terminal from the Utilities menu. Step 2. 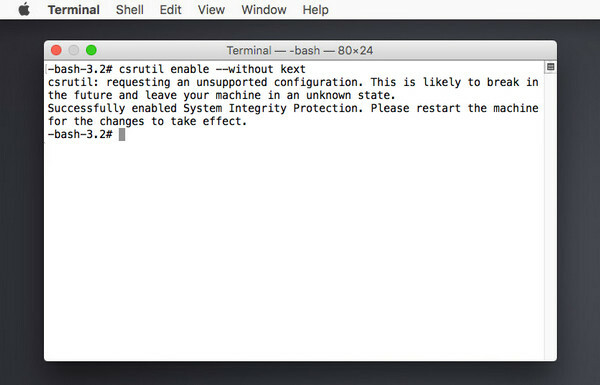 In the window that opens, type csrutil enable --without kext and press return. Step 3. This turns off the part of SIP that NoteBurner needs to run. Now type reboot and press return to restart your machine. After restart, please launch the latest version of NoteBurner Spotify Music Converter on your computer. By doing so, you will be able to get upto 5X conversion speed during converting music files. How to enable System Integrity Protection (SIP) again? To secure your computer, we suggest you enable SIP again if you don't use NoteBurner to convert. Please quit NoteBurner, then boot into the Recovery OS. In the window that opens, type csrutil clear and press return. Now type reboot and press return to restart your machine.